A Salvation Army bell ringer received a coin with ties to a fleet of Spanish galleons sunk in 1715 off the coast of Vero Beach. Longtime volunteer Jim Bessy received the gold Spanish escudo worth several thousand dollars from a donor who wished to remain anonymous. He said the donor handed him the coin for safekeeping Thursday so it wouldn’t get mixed up with the other coins in the kettle. Bessy then turned over the coin Friday to Salvation Army Lt. Jay Needham in Vero Beach. 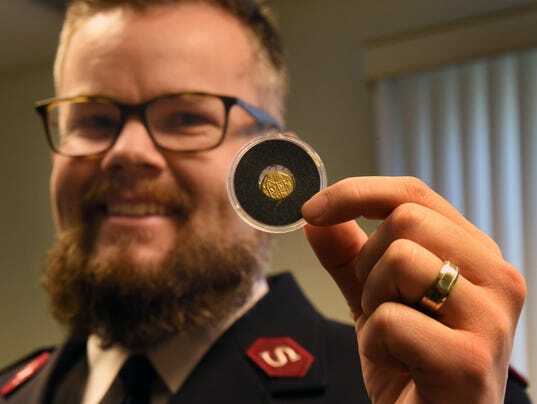 When Needham, in his first year as Salvation Army corps officer in Indian River County, began researching the coin on the Internet, he said he was amazed to learn of its history. In 2015, more than 200 coins were retrieved along the Treasure Coast and valued at more than $1 million. A contractor working for 1715 Fleet-Queens Jewels LLC, a historic shipwreck salvage company based here, recovered the coins that were part of the fleet that sunk in a hurricane off the coast July 31, 1715. The shipwrecks are what give the area of Indian River, St. Lucie and Martin counties its Treasure Coast nickname.